Karnataka govt. has announced MSME Sarthak Scheme 2019 for the job creating Micro, Small and Medium Enterprises (MSMEs). This new industrial policy would attract investment, new technologies and would also generate additional employment. In additional a new policy named “Kalpavruksha Kayaka Niti” will be implemented to promote manufacture of ready use goods. MSME Sarthak Scheme will be rolled out for the comprehensive development of industries, especially to the priority sectors in backward areas of tier 2 and tier 3 centers. The existing industrial policy (2014-2019) in Karnataka would expire in September 2019. 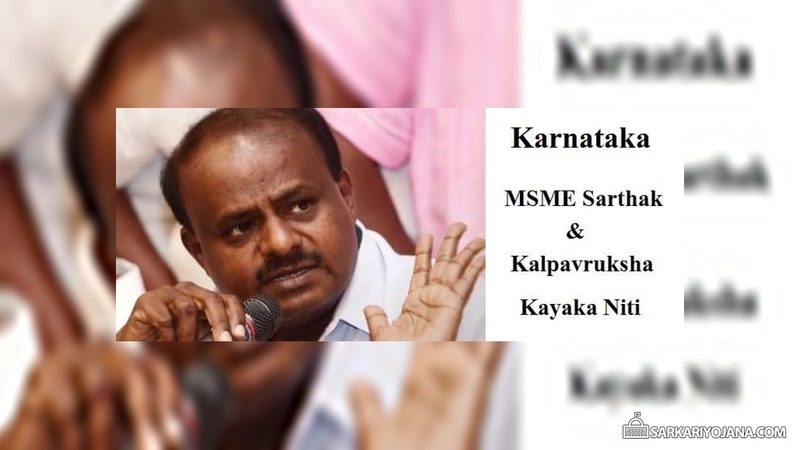 The announcement to launch this new scheme named “MSME-Sarthak” and “Kalpavruksha Kayaka Niti” was made by CM H.D Kumaraswamy while presenting the state budget for FY 2019-20. As the duration of the existing industrial policy 2014-2019 is going to expire, CM has announced a new MSME – Sarthak Scheme in Karnataka. This new scheme would ease the problems faced by the MSME sector which is an essential component for providing employment to the youths of the state. In this MSME Sarthak scheme in Karnataka, govt. will create a “ready to use” system. In this system, govt. will provide quality raw materials, loans and advances, working capital and identifiable brand across the state. The state govt. of Karnataka is going to implement a new comprehensive coir policy named Kalpavruksha Kayaka Niti policy. This scheme will promote manufacture of ready to use goods by utilizing available raw materials in the state. Under this policy, govt. will provide 10% subsidy to self help groups to procure coir. In addition to this, govt. will provide 90% subsidy to the self help groups or private units establishing coir processing unit, subject to a maximum of Rs. 25 lakh. Moreover, Karnataka govt. will also provide subsidy of Rs. 1 crore to private industry undertaking manufacture of value added goods using coir. Furthermore, coir clusters would be established to provide common facilities to the small and micro coir industries. For successful implementation of all the schemes, the state govt. will provide a grant of Rs. 80 crore. In order to facilitate manufacture of new design products in traditional industries, a new design clinic would be established in collaboration with the national level design institutes. In Karnataka Budget 2019-20 speech, CM announced that the state govt. is committed to achieve the target by promoting the manufacturing sector. For this purpose, a multipurpose scheme named “Compete with China” has been introduced. Under this scheme, govt. will establish 9 industrial clusters in 9 districts. The state govt. would also constitute vision groups relating to such industries and is currently acting upon the reports of such vision groups. Various investors are showing interest to establish industries in Koppal, Ballari and Kolar districts. In the upcoming 4 and half years, the state govt. expects that 9 lakh employment opportunities would be created (1 lakh in each district). To continue the scheme in the current FY 2019, govt. will provide Rs. 110 crore.